A wood and leather chewing experience for your parrot. Leather circles are hidden between the large and medium wood slices for your feathered friend to find and dig into. Two plastic bears adorn both the top and bottom of this bird toy giving your bird a sample of wood, plastic and leather. 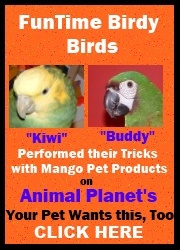 Soon to be your bird's "best friend" too. Parrot toy measures 11" long and 4" wide. My Best Friend Amazon/Severe Macaw Parrot Toy5dcdcJuly 3, 2017my birds really like this bird toy with the leather and some plastic toys in it. I have bought this one more then once too. My Best Friend Amazon/Severe Macaw Parrot Toy5Diana S.April 30, 2017I put this toy in my CAG's cage yesterday, and Chiyome had already removed both the bears and chewed big chunks out of the wooden blocks. She doesn't always take to toys that quickly, so this one must be something pretty special!!! My Best Friend Amazon/Severe Macaw Parrot Toy5BRBDecember 23, 2015I look forward to chewing this on my play gym.